Local public television stations provide a secure, data-centric network using existing broadcasts to deliver encrypted video, files, alerts and other data to public safety recipients via datacasting. Recent Department of Homeland Security (DHS) pilot projects have demonstrated the effectiveness of this datacasting technology. Datacasting is the process of delivering computer (IP) data over a tradition broadcast television signal. This turns television stations into a wireless data network. TV sets do not display IP data, so it is invisible to traditional over-the-air viewers. In addition, all datacasting content is encrypted, thereby restricting access to authorized users. Television’s native one-to-many delivery model uses bandwidth very efficiently. The same model that lets broadcasters deliver the Super Bowl to 130 million people allows a large number of public safety users to be served with a small amount of bandwidth. One Mbps (1/20th of a station’s capacity) can delivery one live video stream, large files, alerts and other data to an unlimited number of users. Additional video streams serving separate end users would require 500 Kbps of additional bandwidth per stream. As someone involved in Emergency Management or Emergency Communication you know first-hand the communication challenges every day, but especially during large-scale emergencies when systems can become congested. Michigan opted into FirstNet, but now the hard work of assuring every responder has the information they need to do their job. This challenge is intensified as video becomes more prevalent in daily operations. Video uses a tremendous amount of your limited bandwidth. The Public Television stations of Michigan can help and have tools that are available to you today. A technology called datacasting enables the powerful public television signals to also securely deliver encrypted public safety data. We see this as an enhancement to Firstnet and would appreciate your support to bring this capability to Michigan. Michigan Pubic Television stations are willing to set aside a portion of their broadcast capacity to deliver live video, files, alerts and other data. Content delivered this way benefits from our native broadcast delivery, meaning you never have to worry about how many specifically targeted users are accessing it. 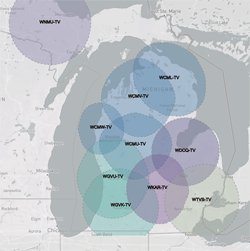 Michigan Public Television can reach every county in Michigan right now! We bring new licensed spectrum that is already built-out and operating. It can enhance rural coverage, scale infinitely and integrate with your current systems. Because the broadcast infrastructure is already in place, adding this data centric one-to-many secure enhancement to public safety information sharing is cost effective. The Department of Homeland Security and others have studied the benefits, security and integration aspects of datacasting. Reports on the benefits and use cases are available on their web site. This technology is already operational in other states, and we want to bring it to Michigan. Please reach out to your SWIC, SPOC, FirstNet rep and even Governor Snyder’s office to support this public/private partnership. With your help, we can integrate with FirstNet and your existing systems to assure that every responder has the information they need wherever they are in the state.